Let’s say they do arm teachers in high schools. Then, what? There are some interesting legal implications; as an employee of the state, if teachers are authorized to carry a gun, then presumably they are authorized to use it – which means they are authorized to employ deadly force on behalf of the state. Just like cops. Do teachers get to use the same excuse as cops, “he scared me” before they blast someone? As any cop will tell you, one of the big problems with using firearms for defensive purposes is initiative. You can’t wait until someone has begun shooting holes in you, because then it’s too late – you have to shoot them first which means having a very finely-honed sense of when someone is preparing to attack. Armed teachers would have to be expected to be able to identify a mass shooter before they start mass shooting, and shoot them first. If the government is arming teachers, they have to grant them that authority because otherwise they’re not really arming teachers, at all. So far the focus of the idiotic discussion surrounding arming teachers has been “arming teachers” not the magic term “law enforcement authority.” Is an armed teacher granted law enforcement authority? I.e. : are they cops? They sure as hell aren’t “militia” because, in the mad swirl that is US gun policy, the “militia” is the students. By telling teachers “you can bring your sidearm to school” the state is authorizing the teacher to be prepared to use deadly force as part of their job – so it sure sounds to me like they are giving the teacher limited law enforcement authority and limited authority to arrest, restrain, or detain. Do teachers have the right to put handcuffs on a student, with indemnity, like a cop? I hope the teachers unions get this clarified. And I expect that, when they realize that they just created an entire, massive, unionized, law enforcement structure, the police unions will not be so happy with the idea. Nobody in anything close to their right mind should be happy with the idea. It will certainly cut down on republican law-makers visiting schools. Any armed faculty that shot Betsy DeVos could legitimately say “she scared me” and the district attorney ought to not issue an indictment because, seriously, we’re talking about one scary threat to education. I just had to try my hand at some of those “motivational poster” style propaganda hits that the NRA likes. “a very finely-honed sense of when someone is preparing to attack” – i.e. : they are carrying a cell phone. … Not that Betsy DeVos has ever been near a school. Doesn’t everyone have the “authorization” to employ deadly force to protect themselves? If I have a gun and someone shoots at me, I can shoot back… that is not illegal. Nobody in anything close to their right mind should be happy with the idea. 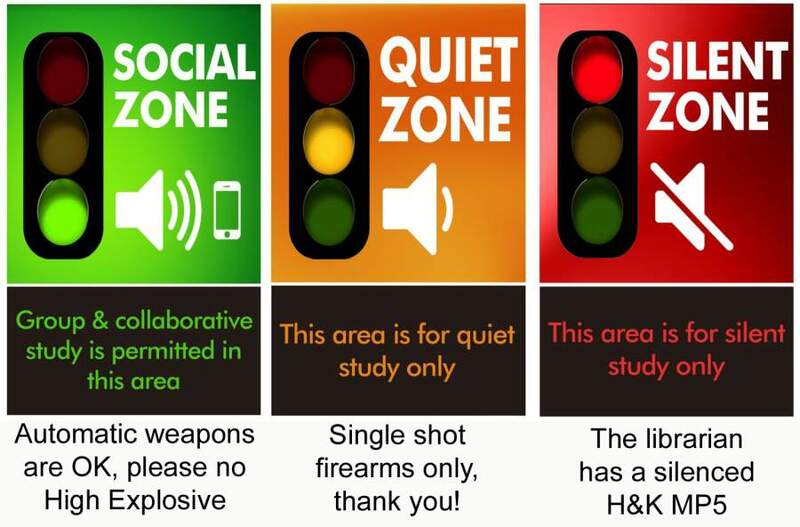 You are missing the obvious motivation behind this from the gun availability advocates. This is yet another marketing ploy by the gun manufacturers to sell more guns. Or at least to prevent the total available market from shrinking by wasting time talking about yet another ludicrous proposal and thereby sucking up the oxygen of outrage. I’m heartened this time as the obvious delaying ploys are publicly being treated with the disdain they deserve by the high school students. Who knows, maybe we have reached the turning point where the gun makers are seen as a problem, similar to big tobacco? This also has the effect that future school shootings can be more readily blamed on any teacher that did not have a gun. Remember how annoying middle-school students are. I think that anyone who deals with them day after day should be armed. Does nobody remember how this turned out for the Silastic Armourfiends of Striterax? Your choice of fonts and colors is a matter of opinion, so I won’t comment on that, but the way how you arranged words was an objectively bad composition. In graphic design you generally try to ensure that there are no weirdly placed empty spaces (which were the problem with your image). Your chosen words and composition was really tricky though. 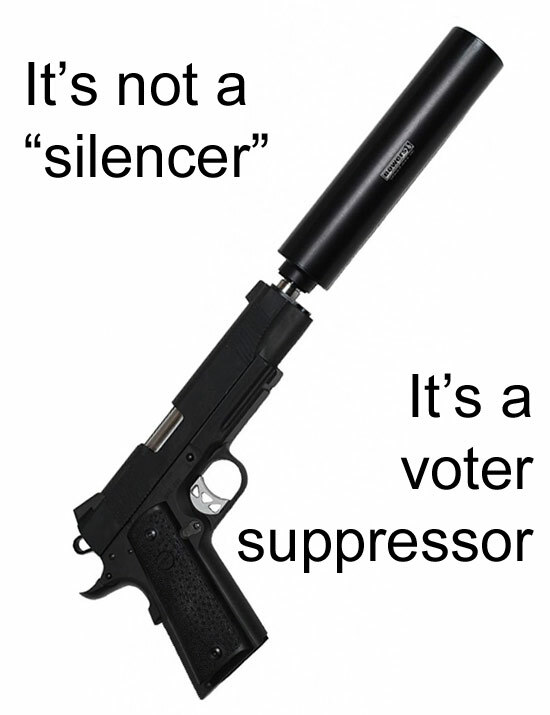 Words “silencer” and “suppressor” were longer than all other words, thus they needed more space. Normally, when I make word compositions for posters, I resize words in order to fit everything neatly. 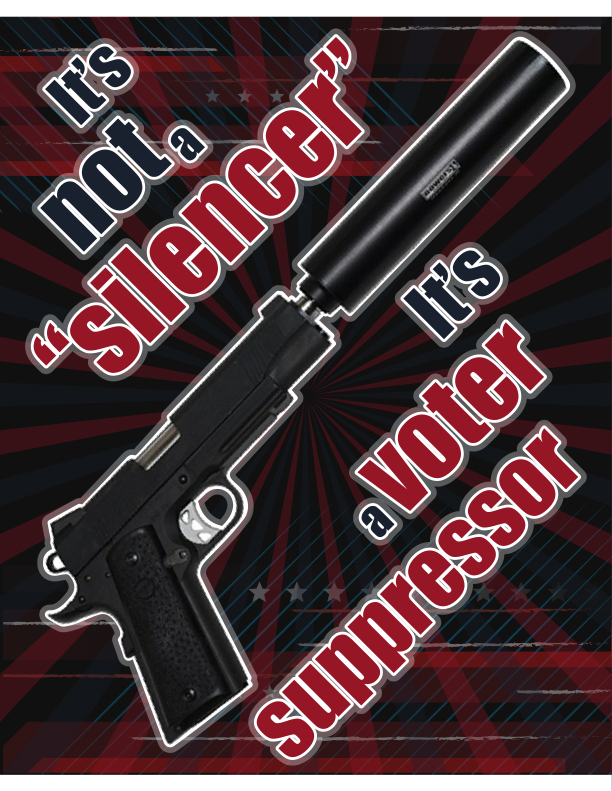 But I couldn’t reduce the font size of the words “silencer” and “suppressor,” because there’s another rule I have to follow—more important words are in larger font (or, at least, not smaller font than the surrounding text). After some thinking, I couldn’t come up with any other composition ideas besides rotating the text. By the way, I checked the NRA store webpage—some of their designs are artistically pretty good. Though, I decided not to imitate their style for my poster, because drawing something like that would be pretty time consuming. Yes, your version is much better inregards to the quality of graphic design. Also, the Red, Black and White is a good play (I presume intentional) on the traditional nazi-flag colours. Arming teachers – ‘murikkkan solution to ‘murikkkan problem! Also, the Red, Black and White is a good play (I presume intentional) on the traditional nazi-flag colours. Actually, no, it wasn’t intentional. When I started making this poster, I knew that I wanted one of those bold color contrasts as always employed by state propaganda (red & yellow for communist states; white, red & blue for America; red, black & white for Nazis—all of these are very bold and contrasty color combinations, there’s no subtlety in any of those). Gun violence being an exclusively American problem, at first I thought about using blue, red & white. By the time I put together the whole image, it became clear that this color combination didn’t work well together with the black gun. At that point I simply substituted dark blue for black and the resulting image looked better this way. I wasn’t thinking about the Nazi color scheme, I was concerned about putting together an image where the color scheme looked pleasing for the eye. Speaking of cops being annoying. Three days ago my mother was in a park, sitting on a bench, talking with her friend. She also had four Pomeranian dogs with her (one sitting in her lap, other three on the ground with leashes). Two cops came to her. In my city it’s illegal not to pick up your dog’s poop. It’s also illegal to release the dog from a leash. I’d understand it if cops confronted people who got caught doing any of these illegal actions. But do they really have nothing better to do than pestering people for no reason? It’s not illegal to simply be in a park with dogs. By the way, for a while already, whenever my mother is with her dogs and notices a cop nearby, she always goes in the opposite direction. Oh, well, probably I should be happy that here police officers aren’t allowed to put their hands in your pockets, they are only allowed to ask questions (without touching you). Yeah, about that. Don’t rely on the law. Rely more on circumstance and human nature. It is a fact that you can defend yourself but how you do depends on state law. In some states such as Washington, DC, you cannot shoot back. In others, you may only defend yourself with a legal weapon, subject to state law.